Although recumbent bikes use ordinary bicycle components, they tend to have somewhat different frame geometries (to put it mildly). Our Tour Easy ‘bents seem to put a particular strain on the front derailleur cables, perhaps because the cable enters from a different angle than the derailleur designers expected. The little finger that’s supposed to guide the cable actually concentrates all the bending force at one spot… precisely where the cable breaks. 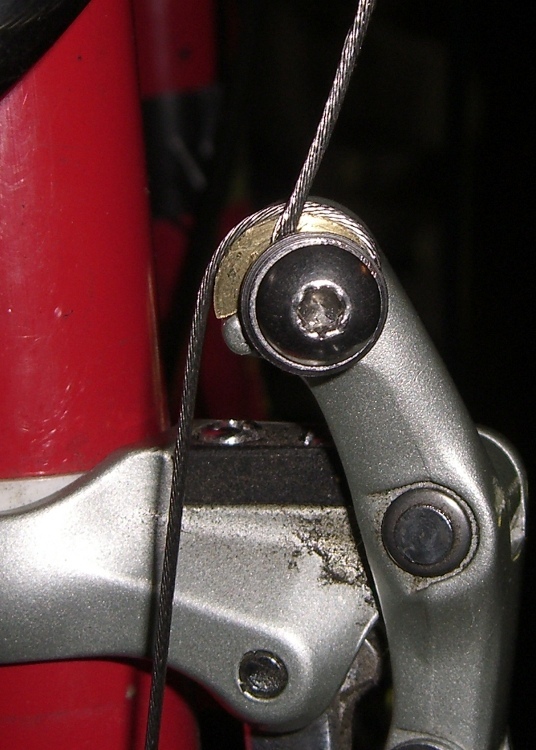 If you look carefully, you’ll see a little brass disk (between the derailleur body and cable) that cradles the cable. I made that for the previous derailleur, but this one has Yet Another Geometry. I know there’s a difference between “high pull” and “low pull” front derailleurs, and perhaps this is the wrong one for this application, but there seems no algorithmic way to sort this stuff out. 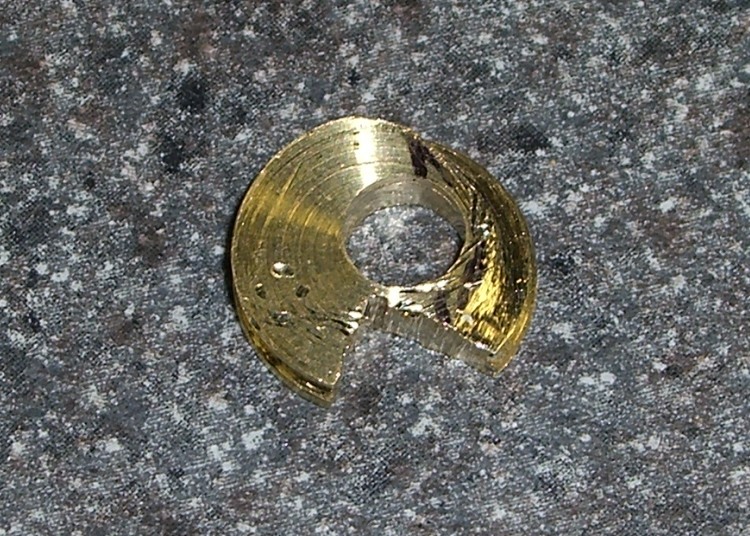 The solution is to make Yet Another Cable Guide Pulley, with a groove around the perimeter, an off-center hole, and a notch to clear the finger. It’s not exactly a pulley, but I’m not sure what else to call it. Maybe just a cable guide? This was a quick-and-dirty manual lathe project, two days before leaving on a trip: turn down some brass stock, put a groove around the perimeter, part it off, drill a hole, and cut the notch. Not a trace of CNC to be found: all done by guess and by gosh, marked out with Sharpies on the actual part in real time running. 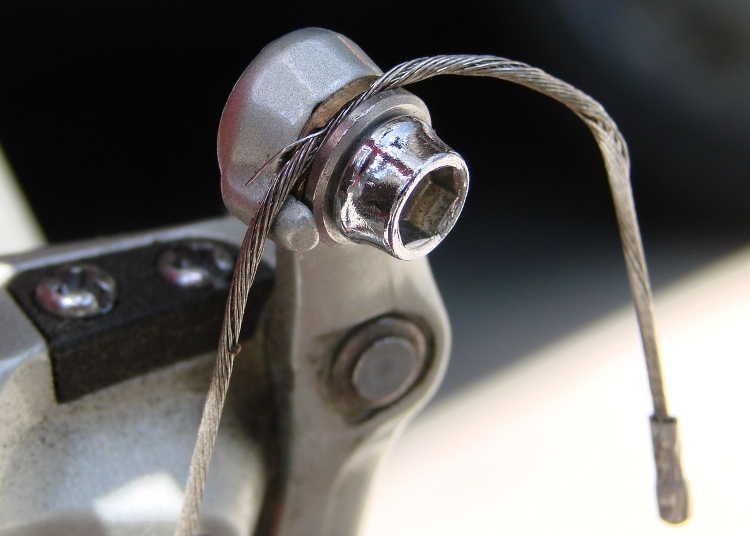 The general notion is that the cable rides the groove smoothly throughout the derailleur’s entire travel range and, thus, doesn’t bend around the finger. This changes the shift geometry just slightly, but, fortunately, long-wheelbase ‘bents have a sufficiently relaxed chainline that indexed front shifting isn’t much of a problem even with slightly misplaced positions. Besides, that’s why SRAM grip-shifter have all those clicky stops, right? This entry was posted on 2009-07-30, 07:40 and is filed under Machine Shop, Recumbent Bicycling. You can follow any responses to this entry through RSS 2.0. Both comments and pings are currently closed.